Can I download a PDF of my Databoards? You can download Databoards as PDF. First, you will need to set up a Scheduled Snapshot of the Databoard(s) that you would like to store static versions of. There you'll have the option to choose between JPG or PDF file formats. 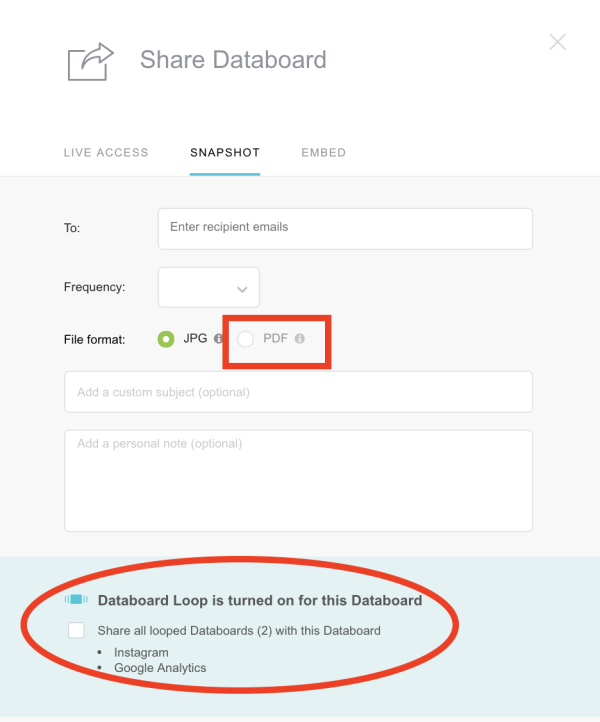 You'll also have the option to include a single Databoard or all Databoards included in a Databoard Loop using Carousel Mode in the Snapshot. We recommended customizing the subject line and making it the same for each Scheduled Snapshot in the Account. That way, you can add a filter in your Inbox so all emails with that specific subject line automatically go to one designated folder. This ensures that your inbox will not be cluttered with reports, but you still have static versions to use in the future. When you want to pull the Databoard Snapshots together into one document you can go through the "Databoard" label in your Inbox and gather all necessary reports.